The bullish abandoned baby occurs at the end of descending trends. Following a long black candlestick, the rate usually opens with a gap and a doji appears. On the third day the rate starts with a gap again. Due to the constant upheaval during the day a long white candlestick is formed. This pattern reconfirms the reversal. The abandoned baby pattern forms scarcely but it is a reliable sign. 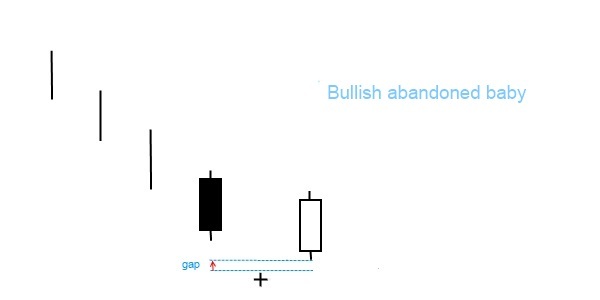 The first gap has an important role in the abandoned baby Japanese candlestick pattern. The rapid fall in the listing reflects the panic on the market. In case of descending trends it happens often that after a high scale fall a reversal takes place. The reversal is reconfirmed by the buyer’s strength on the day of the doji, as well as by the gap occuring on the following day. As most of the group patterns of Japanese candlesticks, the bullish abandoned baby can be observed at stocks. It hardly appears on forex markets.